Last summer after budworms mercilessly devoured my geraniums AGAIN I finally threw in the towel. From then on geraniums and their unwelcome pals, budworms, were verboten on my terrace. Years before I had already thrown in the towel on petunias for the very same reason. Budworms: those evil pests that would insidiously devour my flower buds from the inside as a first course, then turn into fat green caterpillars that would greedily gobble every blossom, then every shredded leaf in sight. Numerous gardeners have apparently recently experienced this familiar budworm invasion, judging from all the visits to Murder among the Geraniums, my post about last year’s budworm battle. Over the years I’ve thrown everything at those crawly green devils: soapsuds, beer, garlic, tobacco juice and what I hoped was a final funeral spray composed of water, mashed garlic cloves, onion powder, dish detergent and vegetable oil. To all, the uppity little critters stuck out their tongues and went merrily on their way chomping on their flower feast. The one thing I didn’t use was insecticide, mainly because the marauders had to actually eat the stuff, which I couldn’t see happening with them invisibly hiding inside flower buds. But last August after years of solicitous loving care and umpteen dollars down the terrace drain, I was finally finished. No more petunias and geraniums for this city gardener. And hopefully no more budworms. With limited botanical knowledge, I hit the Internet to search for flowers that welcomed full sunlight for most of the day. This turned out to be a long list with many flowers I had never heard of. So off I went to the green market on 14th Street to check out the potted plants. It was Memorial Day weekend and the selection was already thin. As always when shopping, I looked over every possible offering before final selection. I had never considered dahlias before and was surprised at their wide variety and color. 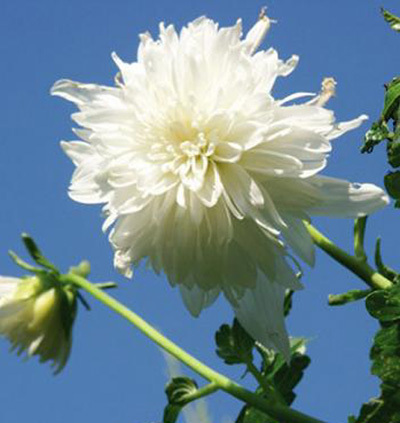 The dahlias that appealed to me most had thick white petals and gold centers that reminded me of daisies. In the meantime, how is your garden growing this summer? Update: Have been holding my breath since I planted my dahlias, but thought some bud worm sufferers out there might be interested in hearing how the flower switch-over has gone. So far – wonderful. The dahlias are healthy and blooming and not a bud worm in sight. They also seem to need much less watering than geraniums or petunias. Nice. Update: Well the whole month of June has flown by and I haven’t seen a single budworm — or any bug — on my beautifully blooming dahlias. A refreshing change. For this climate and sunny terrace, dahlias seem to be way hardier than geraniums or petunias.